Instead, our team of astute and intrepid interns will be splitting into two groups for the coming months to tackle the challenge of learning and applying the Python and Unity programming languages. The first group will dive into Python, a powerful open-source dynamic programming language that is is quickly becoming the introductory programming course of choice in collegiate engineering and computer science curricula - including top programs such as MIT, Cornell, Cal Tech and Carnegie-Mellon. Python, unlike its reptilian namesake, is distinguished by its clear, readable syntax approach, its intuitive object orientation, its full modularity and extensive standard libraries and its strong introspection capabilities. It has application to web and internet development, database access, game and 3D graphics development, network development and more. The BIY interns will learn basic programming concepts such as variables, iteration, functions, and object-oriented programming. They'll be applying these concepts to projects that will include some simple games and contributions to modules within the Build-It-Yourself website, as well as individual projects in their own areas of interest. Meanwhile, a second team of BIY interns will be learning how to create 3D games using the Unity 3D engine. Unity is a multi-platform game development system that features a powerful rendering engine fully integrated with a complete set of intuitive tools used to create interactive 3D content, easy multi-platform publishing, the availability of thousands of ready-made assets and a knowledge-sharing community. The interns will use their Unity skills to help design and create graphics and scripts that will be used to develop a new "Mobile Game Design" webcast workshop to be offered by Build-It-Yourself to advanced builders. Both the Unity and Python projects will be directed by Jacob Bredthauer a 2012 graduate of M.I.T. and member of Build-It-Yourself's development and workshop leader team. For more information on BIY's Advanced Art and Technology Internship Program, click here. 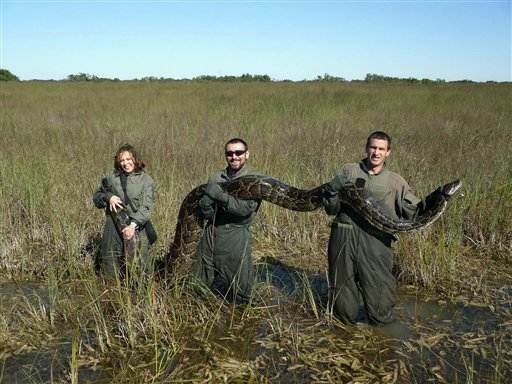 As for those pesky Burmese pythons vacationing in south Florida, according to the National Park Service over 1,800 of the strangulating serpents have been removed from Everglades National Park and surrounding areas since 2002. But any association between the snake and the programming language is purely coincidental. Turns out the language was named after pythons of the British persuasion - the comedy troupe, Monty Python.